We collaborate with partner schools and organizations to customize programming in Morocco. Deepen their knowledge and understanding of Islam, as well as Islam’s relationship to other world religions and the West, while fostering empathy, collaborative opportunities, and lasting friendships between students and citizens of the host country. Possess key contexts and knowledge needed to be able to act as global citizens on issues relevant to them in order to be of service to their fellow human beings at the international level. Gain a greater sense of personal strengths and areas of improvement in the areas of empathy, cultural competency, and leadership. Students catch their flight to Morocco, and arrive next day. Our journey to Morocco with Envoys begins in the nation’s capital. After lunch, students start their tour of Morocco by visiting the famous Kasbah of the Oudayas, and learning about Morocco’s political history. 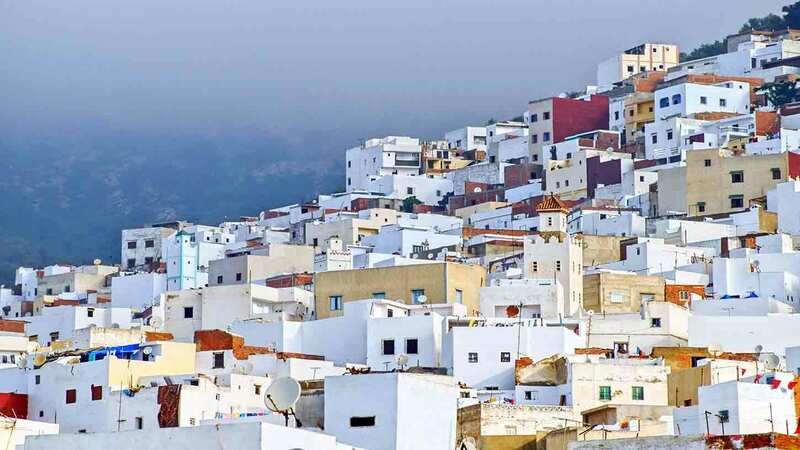 Then, students will be welcomed into the homes of their Rabat host families, where they have dinner, and learn about Moroccan home life, culture, and customs by living them. In the morning, students will see the Hassan Mosque and Tower complex, and the Royal Mausoleum. There, we will start our in country discussions on Islam and religion in Morocco, including the concept of the “Commander of the Faithful.” Then, passing by the royal palace, students will be taken to Parliament to meet with government officials to discuss Morocco’s strides as a country and challenges it faces today. Students are encouraged to begin thinking about topics they would like to research further. Students end the day in Rabat’s medina before returning to their host families. On our third day in Morocco’s capital, we head to the UNESCO National Commission and receive a lecture on the impacts of migration and immigration on Morocco, Africa and the European Union. UN Officials will speak about how they view these challenges, and work to solve them. 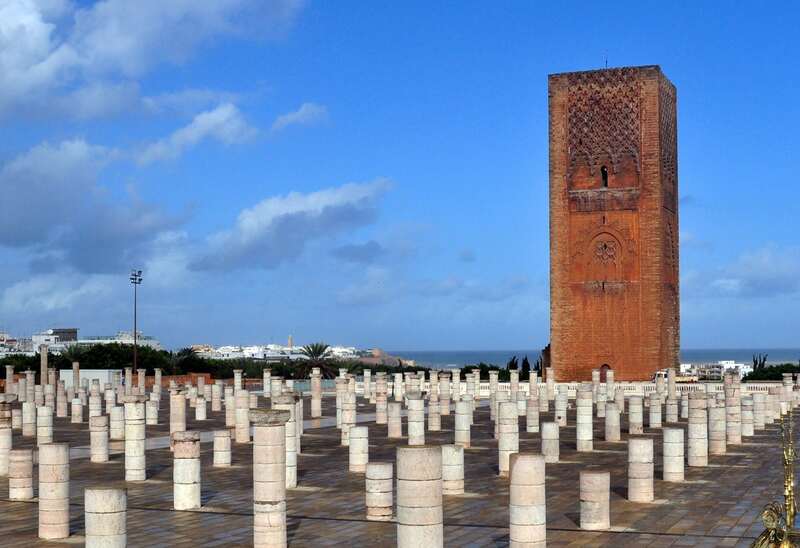 In the afternoon, students will head to Chellah, an expansive necropolis complex outside of Rabat that showcases different periods in the country’s great history. A farewell dinner with host families in the evening. We leave the capital early and head north along the Atlantic Coast to Tangier, Europe’s gateway to Africa. Visiting the American Legation Museum and following the footsteps of writer Paul Bowles, students discover how profound the United States’ relationship with Morocco is. We visit the tomb of the great explorer Ibn Battuta to pay tribute and understand his role in world history, as well as St. Andrew’s Episcopal Church to complement conversations about religious minorities in a predominately Muslim country. We then explore the ancient Kasbah in the evening. We unpack the day over a delicious Moroccan dinner. After enjoying mint tea and breakfast on the rooftop of a traditional riad, we continue our tour of Tangier and talk about the unique challenges of this port city situated just 30 miles from Europe. 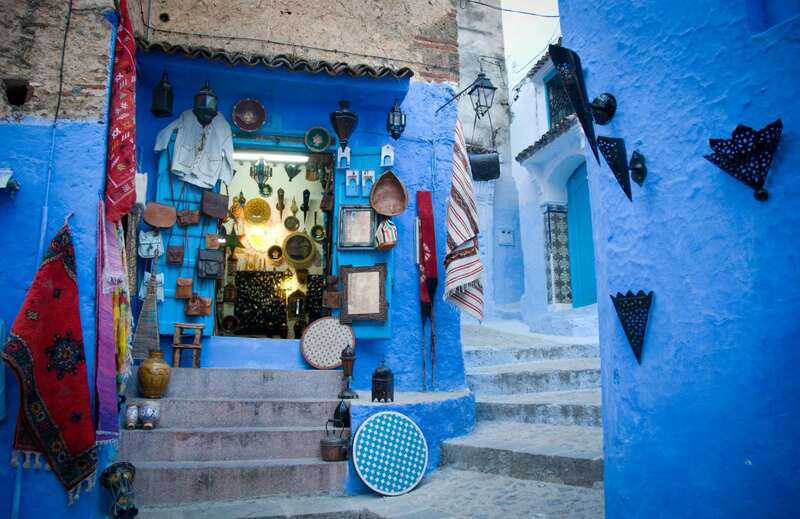 After lunch, we depart Tangier for Chefchaouen, a picturesque Moroccan town painted entirely blue. On the way, we will stop at the Spanish enclave of Cueta’s border to better understand migration, economic disparity, and opportunity from an African perspective; and the town of Fnideq for an opportunity for cultural exchange with peers. In Chefchaouen, we enjoy the Kasbah, mosque, and marketplace while learning about the historical impact the Jewish community had on the city. Overnight in Chefchaouen. 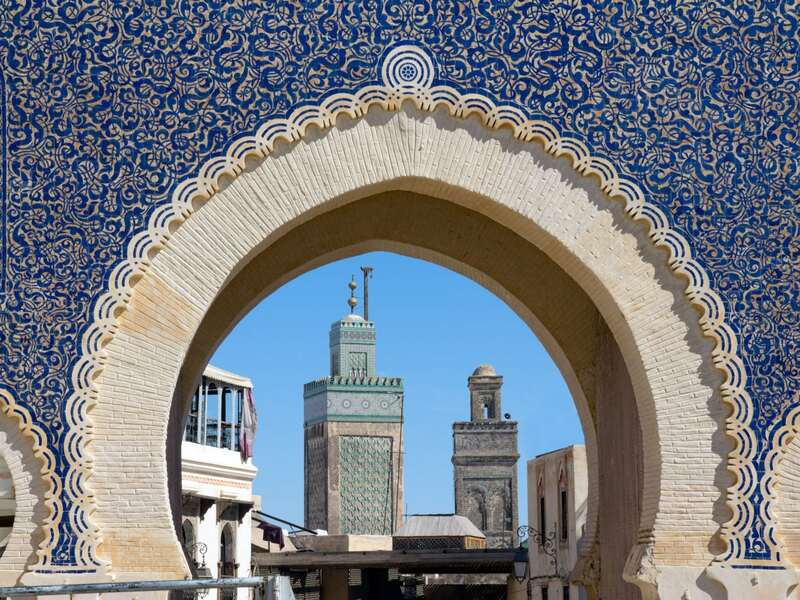 The medieval Moroccan capital awaits! On our first day in Fez, students see Qarawiyyin University—the oldest university in the world. Then, we spend time at Bou Inania, a 14th Century religious college, as well as the great forts of the old city. We sit down with Muslim scholars, and learn about the city’s history and legacy of Islamic learning. Sunset dinner on a rooftop overlooking the city. Wake up to the call to prayer as it echoes through Fez’s old city at dawn. After breakfast, we visit a restored 17th Century synagogue, which reopened its doors in 2013, to continue discussions of religious coexistence in the Muslim world. We will meet with Moroccan Muslims who have worked to preserve Jewish heritage in their country. Afternoon trip to the ancient Roman ruins of Volubilis. Utilizing the ruins as an outdoor classroom and picnic spot, students unpack their experiences, and discuss themes in western, Judeo-Christian civilization and Islamic civilization, as well as their interactions across the Mediterranean Sea. 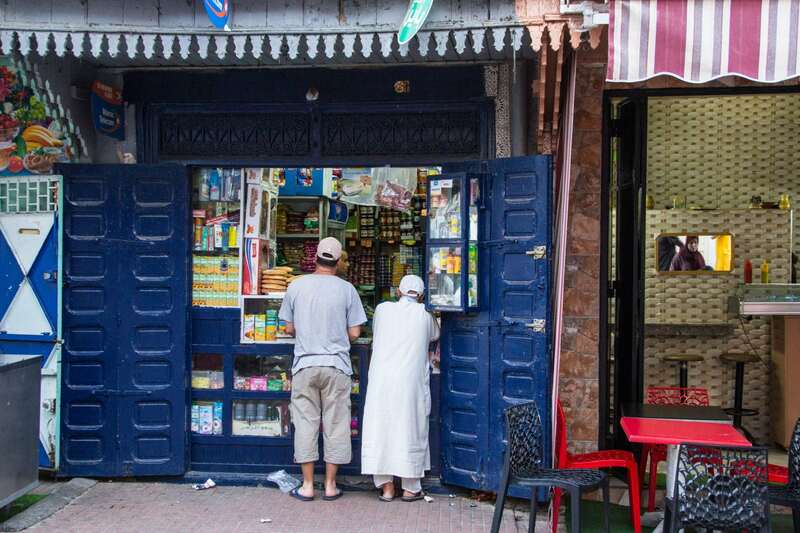 Afterwards, students will split into groups to explore Fez’s meandering medina—hailed as the best-preserved old city in the Arab world and the largest car-free urban zone on the planet—with specific intentional educational goals to achieve during their exploration. Time will be allotted for the purchase of souvenirs, and to see other sites in and around the city students express interest in. We wake up early and head for Marrakech, Morocco. In Marrakech, students will stay in a traditional Moroccan riad with hundreds of years of history. Students receive a tour of the city. At nightfall, we will visit the Dhejmma, a renowned marketplace of food, spices, and wares in order to savor the flavors of Morocco. 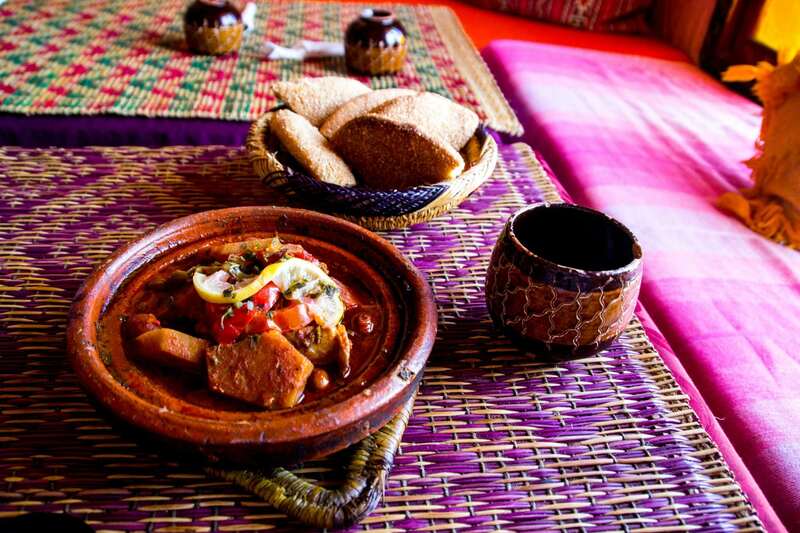 Students will learn how to prepare a traditional dish, and bring a piece of Morocco’s rich heritage into their homes. Students learn how the economy of a traditional marketplace works, and do an exercise in perspective taking in the grand market’s of Marrakech. After lunch, they will continue their tour of the city to discover just why Marrakech is so famous. In the evening, a lecture on the impact of international tourism on Marrakech. Students will wake up early and journey by bus to Tiznit a la the blues song “Long Road to Tiznit.” This pretty town, known as the door to the Sahara, is the sister city of Somerville, Massachusetts. We receive an official welcome to Tiznit and have the opportunity to speak with government officials and religious leaders there. Students discover spirituality in Islam—and aspects of syncretism in Islam—found in Morocco and other parts of Africa. In the evening, a night of cross-cultural collaboration at Espace Asrir. Students will stop at a Berber Cooperative that specializes in argan oil and sit down with the local population to learn from them about their way of life and changes to the country resulting from increased popularity of argan oil globally. Afterwards, grab your keffiyah and your canteens–We are heading into the Sahara—the largest desert in the world! Enjoy the sunset from desert dunes, while learning about desert life. Camp overnight in the desert under the stars. On our third day in Morocco’s south, students are welcomed into the classroom of fellow high school students for intercultural exchange. Students will then head to the homes of some of the Moroccan students for lunch and further exchange. Students also have the opportunity to see this city famous for its silver. Then it’s so long to the south as we head north to Casablanca in the evening. Overnight in Casablanca.